Another InfoComm has come and gone and I have only 1200 words in which to convey the highlights of the show. The first thing I noticed this year was the huge exhibit floor with over 200 new booths spread over two different halls at the Las Vegas Convention Center. My first stop is always the Lighting and Staging Pavilion, which was in a prime location in the Central Hall. There were a number of new exhibitors and I was thrilled to see some innovative products from many of them. But with a show this big, there is no way to keep all of the Staging-focused exhibitors in one place. Key players were positioned in both the North and Central Halls and projection was once again a major focus. The rigging demonstrations returned after a one-year hiatus and the large venue projection gallery was back per usual. There was so much to see! In my estimation, it would now take two full days to properly tour the InfoComm exhibits (if you don't take too many meetings). There is hardly space to highlight all the new products and services shown at InfoComm. There were some interesting trends in a broad sense. Curved screens were everywhere -- projection screens, LED arrays, and direct view systems were undulating in all the major booths. LCD displays were shown in extra-wide formats. Several booths had LCD screens in 3:1 ratio formats -- a very interesting solution when you start thinking of the possibilities. However, the race to be BIG seems to be over. Nothing proved that for me more than the Large Venue Display Gallery where Digital Projection chose to present its smokin' midrange 1080P Titan line against everyone else's biggest, brightest, and loudest projectors. There were also a lot of WUXGA (1920x1200) resolution products, but I do not believe that Stagers will accept a 16:10 format. Manufacturers seemed to have embraced InfoComm for large venue audio, too. All the line array products and digital mixing consoles throughout the floor impressed me. The number of small venue line array products seems to have quadrupled. If I were buying portable PA for rental, I would have to consider some of these new column systems. They are simple, inexpensive, and sound great in more applications than traditional point source speakers. Media switchers, routers, and scalers also continue to improve. I think the biggest scaling buzz was new products from Analog Way who seems to be winning the war for most rentable products. However, Barco opened up two new fronts at the show by buying moving light manufacturer High End Systems (and exhibiting together in the same booth) and debuting an impressive 1.5 ME multi-format video switcher. As projection becomes more and more of a level playing field, I think it will be critical to evaluate signal path products side-by-side. Perhaps next year InfoComm will find a way to hear and see all these Staging products in a real-life application. For many Rental & Stagers, the highlight of InfoComm is the Rental & Staging Forum. Each year a panel of industry experts and thought leaders gather to discuss the issues of the day. Using an Audience response system, the audience was polled about their views on a number of topics. It's no surprise that the hot topic of the session was the outlook on the economy. Some of the audience felt that there would be no downturn as predicted by economists. To a few, the downturn has already occurred and we're just waiting for the resurgence. Others felt that the hype doesn't take into account the counterbalance of international business coming to North America or the value of increased exports. In the end, the majority of the audience expects a significant drop in revenue (compared to 2007) to occur in the last quarter of 2008. In 2007 we asked the Forum audience how much HDTV activity they were experiencing, and learned that only a few companies were receiving requests or executing projects with HD content. We revisited the topic this year and found that there has been a huge uptick in HD discussion over the past twelve months. However, most comments from the panel and audience indicated that customers are still very uneducated about HDTV (and indeed, many AV Rental & Stagers seem to lack a basic understanding of HD formats). There is still much confusion between a simple 16:9 format (video or computer generated) and true HDTV. In addition, the variety of legitimate HDTV formats continues to confuse the average AV professional -- not too mention customers. This year was the first time education and events had any memorably Green focus, but it was just dipping the toe in the water. Discussing Green topics at the Forum was a preamble what will be a to topic in the coming years. Rental and Stagers are just beginning to see requests for Green statements in proposal packets. While this year's Forum showed there was not a huge dialogue as of yet, several companies explained their efforts and the payoff. The AV Industry has major opportunities to be a leader in conservation and the InfoComm Show (and its attendees) could do a lot to reduce its own carbon footprint. In my seminar called The Rental & Staging Business Survival Kit, the ninety-plus attendees were especially interested in three topics: delivery charges, sub-rental costing, and sales commissions. Any one of these could have filled the two hours all by themselves. The theme for the day was "Do the math" and we started by calculating the true cost of a simple delivery and setup. The increasing costs for fuel seemed like a drop in the bucket compared to labor rates and vehicle leases. In the end most students could see how their companies were undercharging for deliveries. Next we reviewed the real costs behind sub-rentals and reaffirmed the importance of capitalization for rental companies. Just accounting for the real cost of pickup and return of sub-rented gear will often turn an apparently profitable transaction into a loser. With the dependence that so many firms have on wholesalers and other sub-rental suppliers, I expect that some folks will be looking closer at their purchasing budget next time around. And sales commissions are always a lively discussion. The seminar emphasized the importance of having incentives that encourage the right behavior and results. I encourage businesses to also review bonus plans to be sure they encourage lean operations and efficient processes. Spreading profit to the people who are most responsible for maintaining the bottom line is just as important as commissions for growing revenue. InfoComm 2008 was record-breaking, innovative, and often awe-inspiring. I felt that R&S attendance was significantly up, and I know the Forum and the reception afterwards were the largest ever. I hope you were able to make the best of this opportunity. Mark your calendars now for June 16-19, 2009 in Orlando. Will the rental sector continue to buy or will economic concerns force them to cut back? Wireless mics are the number one critical purchase need for 77 percent of all respondents. Huge demand is seen in projection screens in 16:9 formats. Demand for Digital Moving Lights has surpassed that for decorative and low-density LED products. Aluminum truss shows a surprisingly strong demand. Flat panel displays have not reached their potential as most companies intend to increase their inventories. 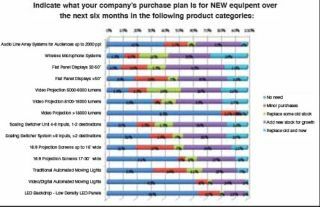 Large venue projection (18k lumens and above) was the only product category that did not show much demand. To interpret the chart, find the product category of interest. The line to the right is broken down by responses indicating the percentage of those who gave that answer. For instance, the first line tells us that 41 percent of the respondents have no need for small venue audio line array, but 32 percent plan on adding inventory to accommodate growth. Download the complete June 08 Survey and past results at: www.trstimson.com/surveys. Each month The Stimson Group conducts a short survey of AV industry professionals about a variety of topics. To participate in or comment on those surveys, email: surveys@trstimson.com.